The data for this java application is from a web servers log file. The data is placed in a PostgreSQL database using a perl script that runs via cron four times a day. The web server log data, while containing only nine pieces of information per access, can be viewed in a large number of desired contexts. 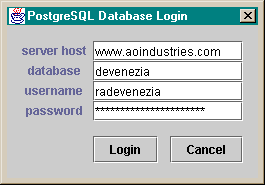 This application was designed to be flexible enough to accomodate any hierarchy that can be indicated using a SQL statement. Most 'explorer' style systems are comprised of two visual pieces, a left side tree and a right side table or list. In this application the tree is used to navigate a query's class hierarchy to a node that corresponds to a specific subsetting query. Assume the uppercase columns represent some hierarchy and the lowercase letters represent some measurement (metric) or other observational information. The left hand tree presents a navigation through all the combinations of values of A,B,C,D encountered in the results of the query. A node in the tree represents a set of specific values alpha/beta/gamma/delta.The right hand table shows the rows corresponding to the tree node; e.g. where A=alpha and B=beta and C=gamma and D=delta. Here is a screenshot of a Server, Year, Month, Day, Client hierarchy with corresponding access information for the selected node Year=2000 and month=10. Note: Even though the tree shows other sub-nodes of month 11, the selection is the level 2 10 value. The selected node drives what is shown in the table. In my situation I only have a 56k modem network connection, so a query that returns thousands of rows would take a long time to transmit the results to the resultsSet in the java application. To a user, the application would appear to have died or froze. Many 'explorer' systems that allow navigation through a large time consuming complex SQL query might typically perform the entire query and append to a where clause to restrict information returned to provide a tree nodes children or the matching rows of a selected node that are to be shown in the table. Oft times, the first levels of a query can be reduced to a simpler, faster executing query. The http.log.Explorer addresses several concerns regarding low-speed access to the database tables. I implemented a scheme that allows each level of the tree to obtain it's children using a hand optimised query. The additional query brainwork on the developers part pays off by maximizing information throughput. (Implementing the brainwork done to reduce a complex join to the simplest necessary query at a given hierarchical level could be the subject of another, very sophisticated, java class.) The offset for this gain is more load on the presumably faster database server. Most queries to obtain the node values to show below a node selected to be expanded require knowledge of the values of the nodes to reach that node. This is the node path. The main program instantiates the tree and table components in a grid bag layout so that the tree and table will resize when the application frame is resized. It presents a database login dialog, attempts connection to the database server, tells the tree what hierarchy it will display and installs a TreeSelectionListener that responds to a node selection by changing what rows and columns are shown in the table. Presents a dialog for obtaining values needed by the JDBC driver manager when a database connection is to be made. Demonstrates how an object can request focus when a form is created. An object used to transfer the values entered in the Login dialog back to the dialog caller. Template for delivering information needed to render the tree hierarchy. This class is the crux of the application. getLevelCount() returns how deep the tree is. childQuery() returns the query that should be performed to determine child node values. tableQuery() returns the query that should be performed to obtain data to show in the table when a node is selected. Extensions of this class must deliver valid queries for each level up to LevelCount. Each extension of this abstraction concretizes a specific hierarchy and the (hopefully hand optimized) templated queries that should be performed to obtain necessary data when a node is selected. Templated queries contain tokens that represent tree node path values. Tokens are resolved in the resolve() method. A templated query is any valid SQL query, that may conditionally contain node path level tokens. Each token encountered is replaced with the value of the node level in the path to a node. The node path level n can be specified in either a absolute descending manner (n>0) or in a relative ascending manner (n<0). Each token encountered is replaced with the value of the level in the path to the node. The replacement is performed by the resolve() method. n < 0 represents the NODE's nth parent value. n = 0 represents the NODE's value. n > 0 represents the TREE's nth child value in the path to NODE. Note: the root node value is only obtainable using n < 0 fashion. This extension of AbstractHierarchyLevelQueryModel contains the templated queries that are used by the HierarchyNodes. There is one templated query for each level of the tree. The queries are stored in arrays. HierarchyNode uses this class to obtain resolved queries for a given node at a given level using methods childQuery() and tableQuery(). The node_childQueryTemplate demonstrates absolute descending tokens. The node_tableQueryTemplate demonstrates relatively ascending tokens. "select distinct substr(local_time,1,4) from access"
, "select distinct substr(local_time,6,2) from access "
+ "where substr(local_time,1,4) = ':1:'"
, "select distinct substr(local_time,9,2) from access "
+ "where substr(local_time,1,7) = ':1:-:2:'"
, "select distinct id_value, client_inet from access, ids, client_inet "
+ "where substr(access.local_time,1,10) = ':1:-:2:-:3:' "
+ "and access.client_id = ids.id "
+ "and ids.id = client_inet.id "
"select * from access_log "
, "select * from access_log "
+ "where substr(local_time,1,4) = ':0:' "
+ "where substr(local_time,1,7) = ':-1:-:0:' "
+ "where substr(local_time,1,10) = ':-2:-:-1:-:0:' "
+ "where substr(local_time,1,10) = ':-3:-:-2:-:-1:' "
+ "and client = ':0:' "
An extension of DefaultMutableTreeNode. Each instance is a node in a tree. Each node knows its value, depth and HierarchyLevelQueryModel. Each node also has a reference to a JDBC statement that can be used to execute queries. This class uses the HierarchyLevelQueryModel to obtain the query to perform to obtain it's children when getChildCount() is called for the first time. It also can deliver the resolved queries of the HierarchyLevelQueryModel via it's getChildQuery() and getTableQuery() methods. A generic extension of AbstractTableModel. Given a JDBC statement handle, and a query to perform, a ResultSet is obtained from the database. Some ResultSet meta information is placed in a vector, the ResultSet row data is placed in a vector of vectors and the ResultsSet is closed. getColumnName, getColumnCount (), getRowCount () and getValueAt() methods are overridden to return information from the vectors. A specialized runnable extension of AbstractTableModel. This class is especially suited for low bandwidth connections to the database server. Since psql has special SELECT clauses LIMIT and OFFSET a query can be continually reissued against the database (incrementing the offset each time) until a ResultSet returns no rows. Each limited set of results are added to a vector of vectors that are used to deliver data to the table. In between the requeries the model performs a fireTableRowsInserted() event so the table knows it should adjust it's scrollbar and display more rows if necessary. The class is run in a separate thread when instantiated. The class' run() simply fetches N rows at a time (using the LIMIT and OFFSET feature of psql) until no rows are returned at a give OFFSET. If the underlying tables is prone to be updated during the repeated queries, this class will be non-robust. Please contact me if you are interested in the java source. Enhanced table smarts; e.g. when a new query is performed, retain the column order and column width that were present in the previous query. This page was last updated 19 December 2000.